The smile of a once-naked street urchin from the streets of Kathmandu now lights up the Kathmandu Chabad House where he lives in Nepal. A nearly naked 11 year old street urchin from the streets of Kathmandu attached himself to a Chabad-Lubavitch rabbinical student last year and begged for help. Now his smile lights up the Chabad House where he lives in Nepal. The boy was covered with a scanty plastic bag when he arrived, Chabad-Lubavitch emissary Chani Lifshitz told the Lubavitch.com website in a phone conversation. Lifshitz described the scene while on a trip to Israel to organize supplies for the massive annual Passover seder held at the Chabad House, home to the Lifshitz family for 13 years. Thousands of Israelis who backpack through the area are always present for the holiday event over which her husband, Chabad-Lubavitch emissary Rabbi Chezki Lifshitz presides each year. The complicated process of ordering and shipping the matzos and other supplies takes a lot of time; the rabbi remained back in Nepal with the couple’s five children and 12-year-old Bim, while his wife carried out the Passover mission in Israel. 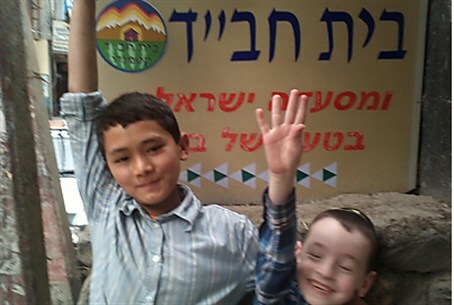 “Hi, I’m Bim, the boy from Beit Chabad,” he tells the thousands of Israelis who arrive at the Kathmandu Chabad House each year as they trek through the Himalaya mountains when they are discharged from mandatory army service. The boy was severely malnourished, his body raw from the beatings he had received from his handlers when his daily earnings on the street were a disappointment. A doctor was brought in to administer first aid, and the boy’s matted hair was cut to reveal his beautiful face. He was fed and clothed, and the couple did all they could to make him comfortable, while Bim explained how he had thought to seek the Chabad House. “He had heard of the Jewish place where people find help,” Lifshitz said simply. But so had his traffickers, who quickly figured out where their source of income had fled and began a campaign of harassment against the family. Finally, the rabbi paid Bim’s handlers for his freedom and took him into their family, sending him to a private school where he has shown he is a quick learner. “Last year he did not know how to read or write. Now... he’s skipped two grades since he started formal schooling. He’s incredibly bright,” Lifshitz said. Bim is not Jewish, and conversion is not on the agenda, Lifshitz said. “We did not adopt him to make him Jewish. We adopted him to save his life,” she said bluntly. Bim, on the other hand, is learning Hebrew and starting to talk about having a bar mitzvah next year like his “older brother” did. And he is insisting that his Jewish name is Binyamin. The story has made headlines with so many people passing through – eventually even United Nations representatives stopped by, wanting to know more. “I hope this will raise awareness of the plight of Nepal’s street children,” Lifshitz said.